The improved Loyola Marymount Lions get a share of college basketball's spotlight Thursday night when they host the high-powered Gonzaga Bulldogs in a nationally televised showdown. Tipoff for the West Coast Conference contest is set for 11 p.m. ET from Gersten Pavilion. The Bulldogs lead the country in scoring offense and margin of victory at 26 points per game. They improved that average with a 94-46 thumping of rival St. Mary's in their last outing. However, the Lions are on pace for their best season this decade and were respectable in a 73-55 loss to the Bulldogs in their first meeting. The Bulldogs are 19.5-point sportsbook favorites and the over-under for total points scored is 138.5 in the latest Gonzaga vs. Loyola Marymount odds. Before you make any Gonzaga vs. Loyola Marymount picks, check out the college basketball predictions from SportsLine's proven model. The model, which simulates every game 10,000 times, has raked in the winnings for those following its picks. Over the past two years, the SportsLine Projection Model has returned more than $5,200 to $100 players on its top-rated college basketball picks. 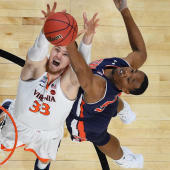 It also entered Week 15 of the 2018-19 college basketball season on a blistering 99-67 run on top-rated college basketball picks against the spread. Anyone who has followed it is way up. Now, it has locked in on the Gonzaga vs. Loyola Marymount spread and crunched the numbers. We can tell you the model is leaning to the over, and it has generated an against-the-spread selection that hits nearly 60 percent of the time, indicating the line is way off on this game. The pick is available at SportsLine. The model knows the high-powered Bulldogs appear unstoppable at times, particularly against conference opponents. They lead the nation in scoring at 91.4 points per game and in field-goal accuracy at 52.8 percent. The massive gap between Gonzaga and the rest of the WCC was never more evident than in its shellacking of rival St. Mary's. Any hope for a competitive game was squashed early as the Bulldogs scored the first 11 points on their way to a 53-20 halftime lead. They shot 58.3 percent from the field while holding St. Mary's to 25.9 percent. They also had 22 assists to one for the Gaels and a 42-31 rebounding edge. Brandon Clarke had 24 points and Rui Hachmiura had 18 for Gonzaga, which had five players reach double figures in scoring. Even so, the Bulldogs aren't assured of covering the road number against an improved Loyola Marymount club that beat the spread in the first meeting between these clubs. The Lions haven't won a WCC title since 1999 when they were led by college basketball icons Bo Kimble and the late Hank Gathers, who was the tournament MVP of consecutive title-winning clubs. They appear to be in the process of returning to prominence under coach Mike Dunlap, who briefly coached the Charlotte Bobcats. The Lions already are guaranteed to have their most wins in the past six seasons. Dunlap enjoys relative obscurity at the small, private school with ocean views that also sits in the shadow of Gonzaga for basketball supremacy in the WCC. Although some basketball observers might recognize his name from the brief NBA tenure, Dunlap is better known in college basketball circles as one of the winningest Division II coaches of all time. He went 248-50 with two national championships in nine seasons at Metro State in Denver. Who covers Gonzaga vs. Loyola Marymount? And which side of the spread cashes in nearly 60 percent of simulations? Visit SportsLine now to find out which side of the spread you should be all over Thursday, all from the model that has returned more than $5,000 to $100 players the past two years.